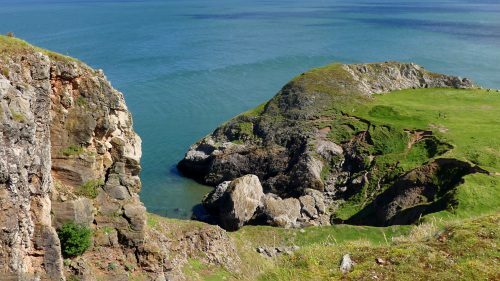 The Little Orme is a fascinating site to visit at any time of year as it holds a variety of habitats in a relatively small area and there is always something to see, but January is the perfect time to see some of its special winter visitors, charismatic Grey Seals. 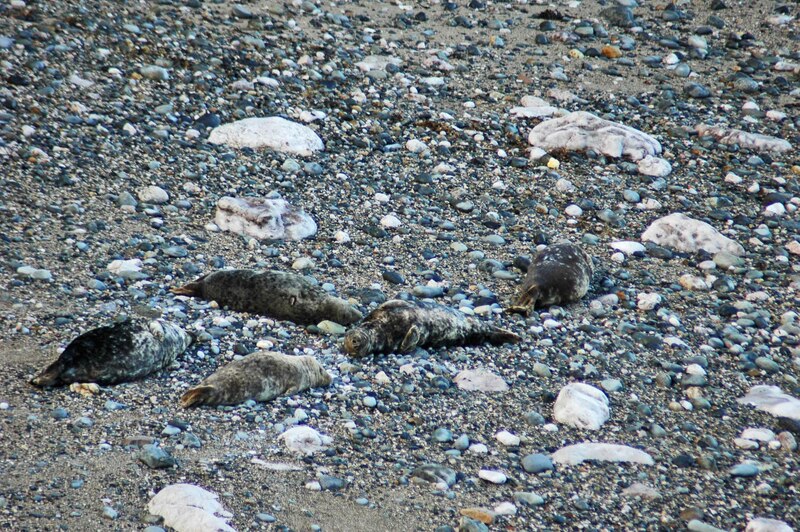 There are never many, but the pebbly beach of Angel Bay regularly attracts a number of new mothers and pups that come to rest on the shore of the little cove of Angel Bay. 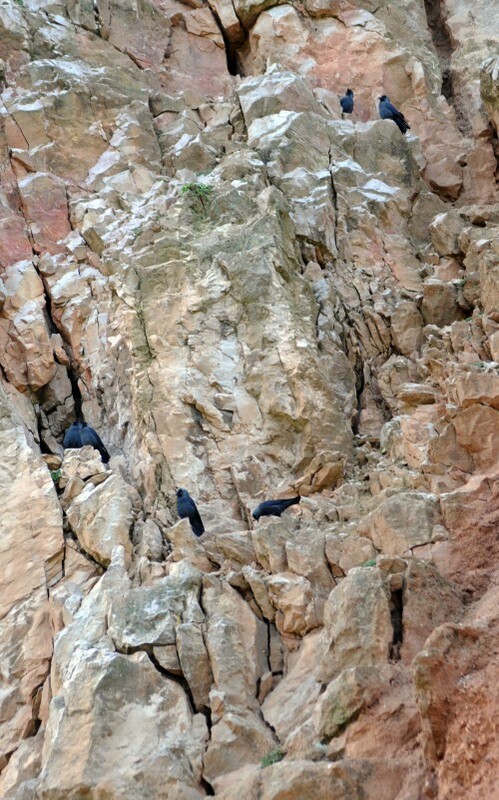 They are pretty much undisturbed there as the beach is only accessible by a steep narrow track down the cliff and they don’t seem to mind interested people watching them from above,even those armed with cameras. 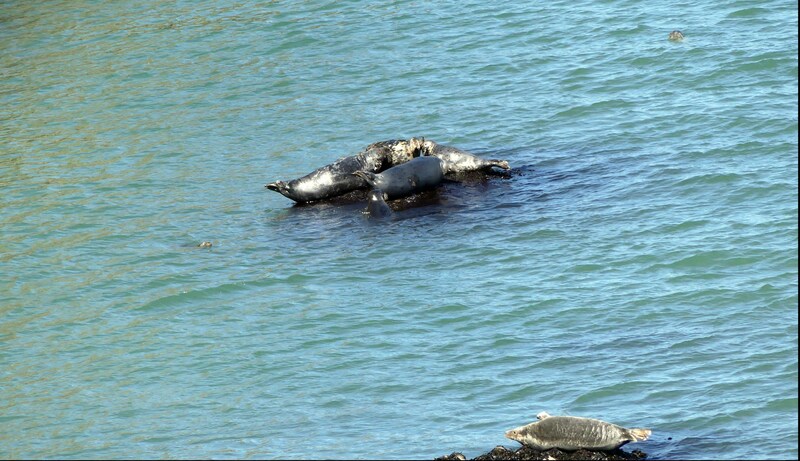 Today I was pleased to discover there were indeed grey seals here; five adults in a group, seemingly dozing, while three tiny young ones were practicing their swimming techniques in the waves. 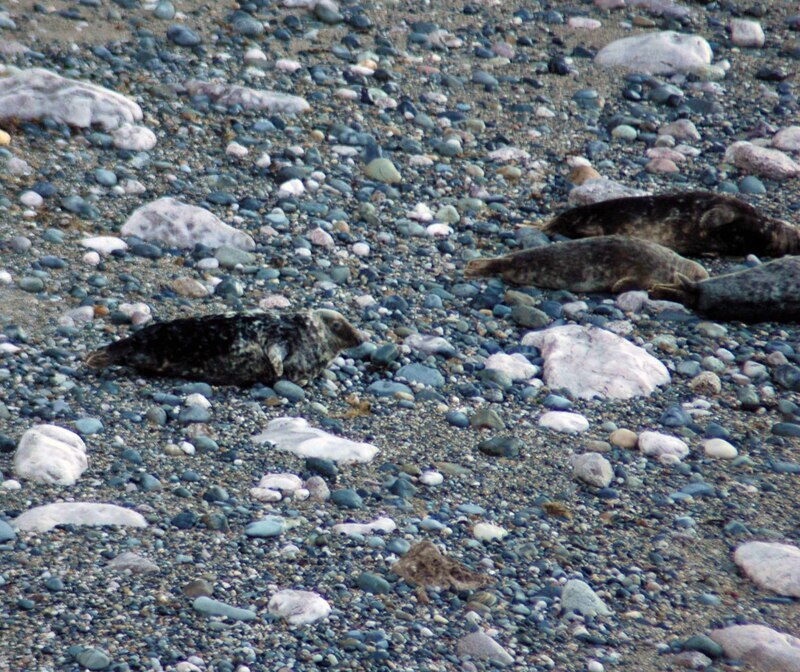 The adults appeared not to be too concerned for the safety of the youngsters; grey seal pups have to grow up fast and must be able to start fending for themselves at about a month old, once they’ve shed the pretty white fur coats they are born with. The little ones seemed quite happy in the water, although getting back in, fighting against the incoming waves seemed to present more of a challenge. 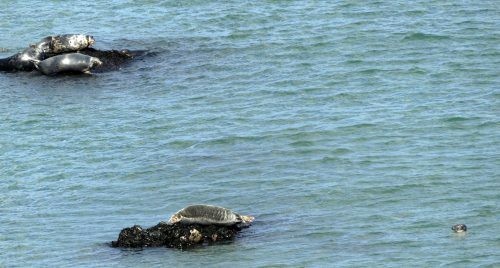 The adult’s apparent slumber came to an abrupt end when something caused them to snap out of it and travel surprisingly quickly down to the sea edge. 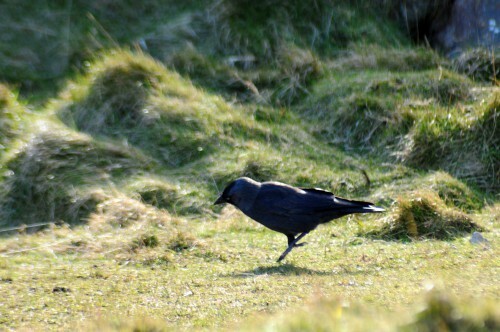 One of the five was considerably slower and to my eyes was fatter too. Is it possible she was still pregnant? 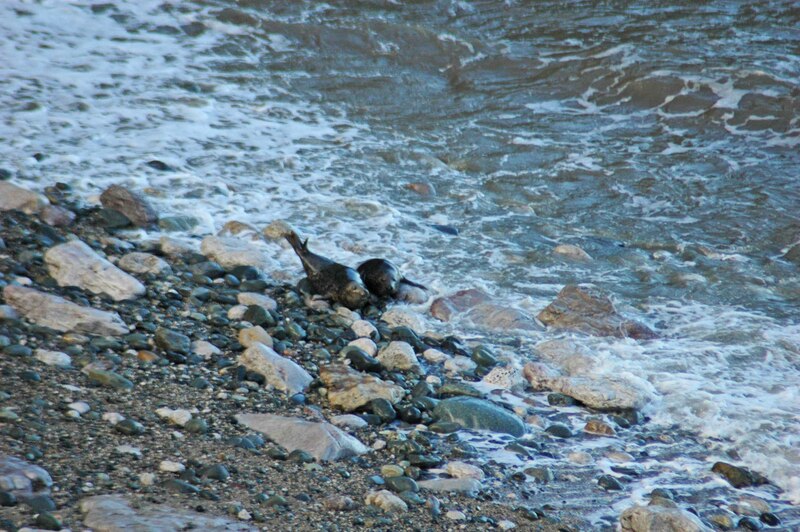 As they were heading towards a young one I wondered if they had perhaps been summoned, but then as it watched from the surf of the sea edge they simultaneously stopped and flopped down again, unimpressed. 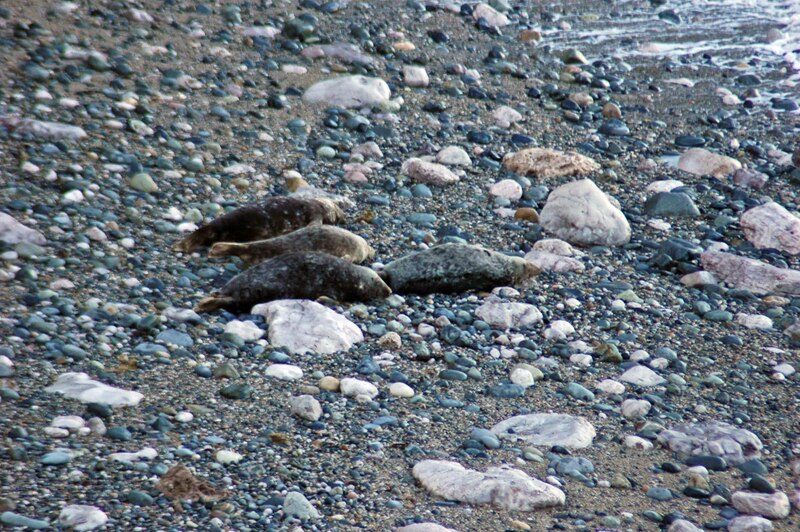 From November onwards female grey seals return to their favourite beaches to give birth and mate again. 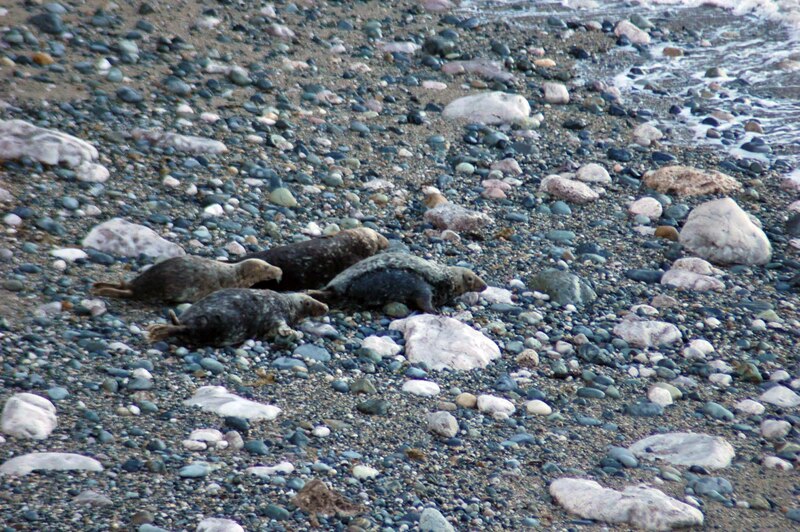 The milk of the grey seal is very rich enabling the pups to put on weight quickly. They have to grow fast as their mothers stay with them for only three weeks before returning to the sea. The mother does not feed herself whilst feeding her pup, so hunger soon drives her back to the sea. Young seal pups are covered in white fur when they’re born. 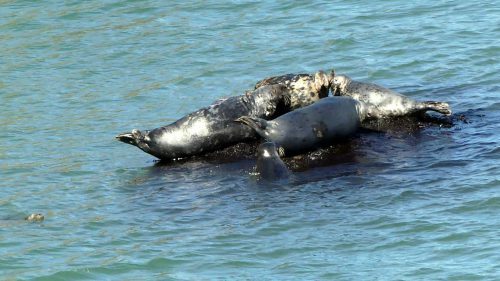 Within a month or so they shed the pup fur, grow dense waterproof adult fur, and leave for the sea to learn to fish for themselves. The pup soon follows and must teach itself to hunt for food. 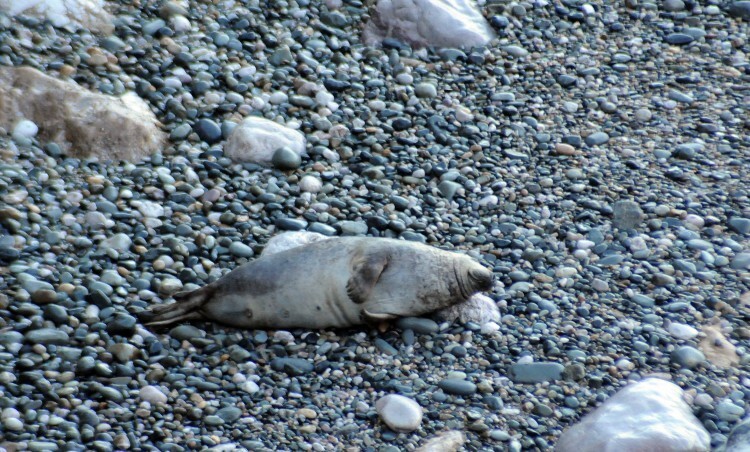 I have posted about grey seals several times before, my favourite being a post about the rescue of a very young pup from beneath the sea-break boulders at Rhos Point by some of the caring keepers from the Welsh Mountain Zoo. 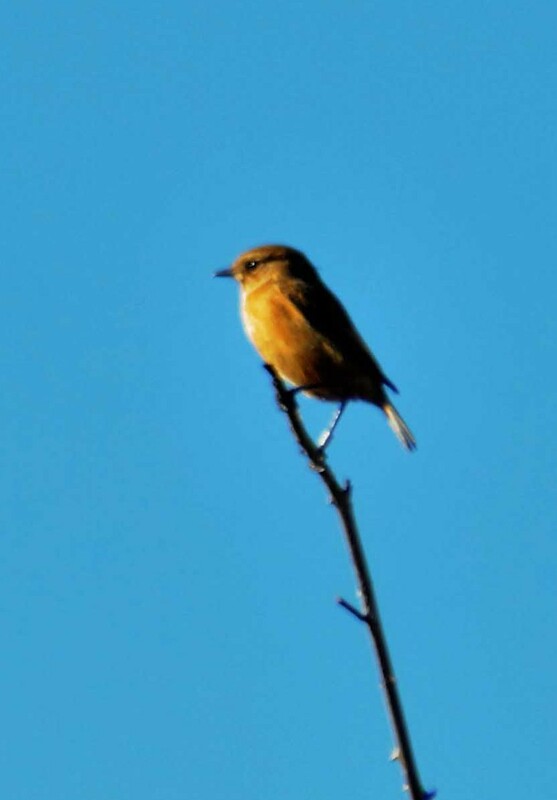 The photograph below is from that post. 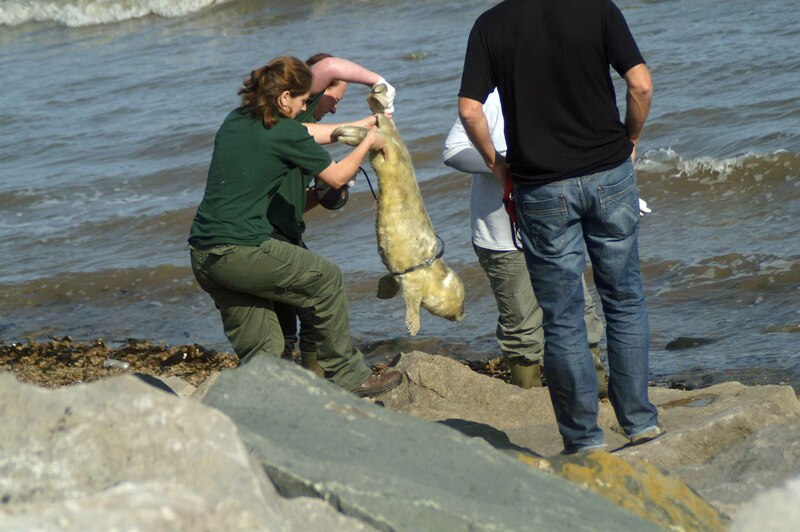 An account of the baby seal rescue was reported in the local paper yesterday, with a picture of a baby Grey seal, (not sure if it was actually him) on the front page, and one of my photos of the actual rescue accompanying the article. 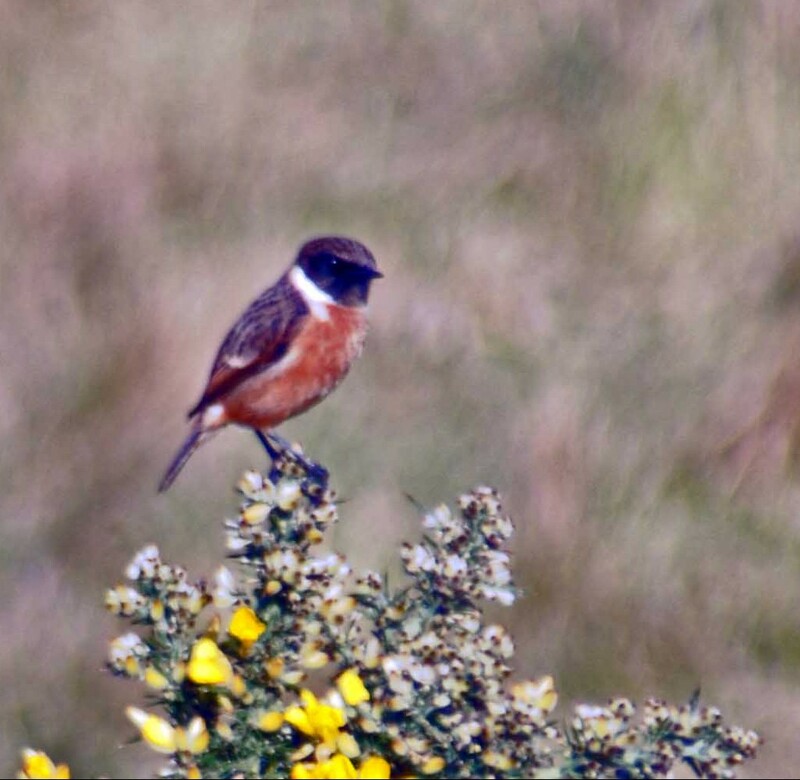 Hopefully the article will help to raise awareness of the proximity to us of these lovely animals and of our responsibility to their welfare. 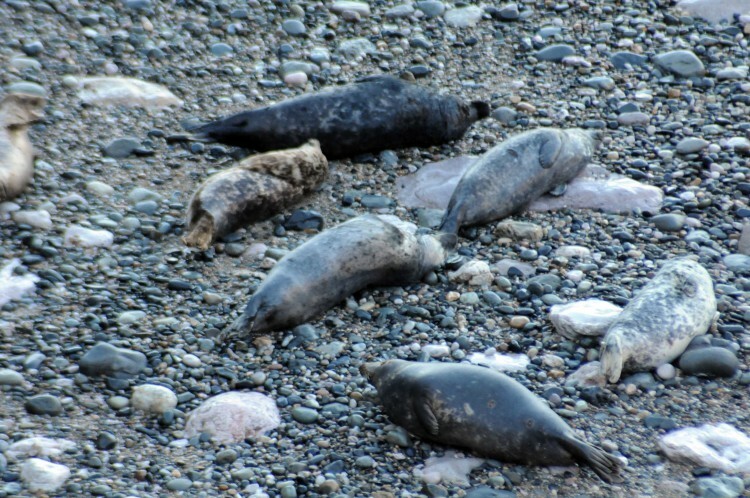 The breeding season for Grey seals is underway now and will mostly go smoothly and escape our notice, but there will be times when intervention is necessary. Meanwhile, happily all seems to be going well for the rescued seal pup; now relocated to the safety of the Seal Unit at the Welsh Mountain Zoo, he has been given the name ‘Jakey’ and I have no doubt at all that he is being very well cared for there. 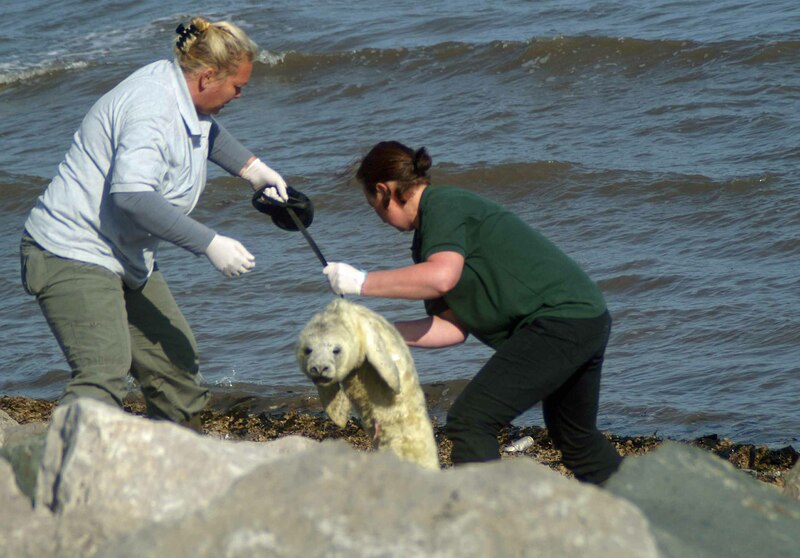 Raising a baby seal is a huge undertaking and I imagine, very labour intensive. In a natural situation, pups would drink about 3 litres a day of their mother’s milk, which is about 60% fat, and their weight increases rapidly, they put on about 35 to 40kg in their first 3 weeks. At the Zoo, rescued pups are fed a special fish-paste diet to begin with, then will be taught to eat whole fish in around a month’s time. He will need to be carefully monitored and the aim is to release him back into the sea sometime in the New Year. 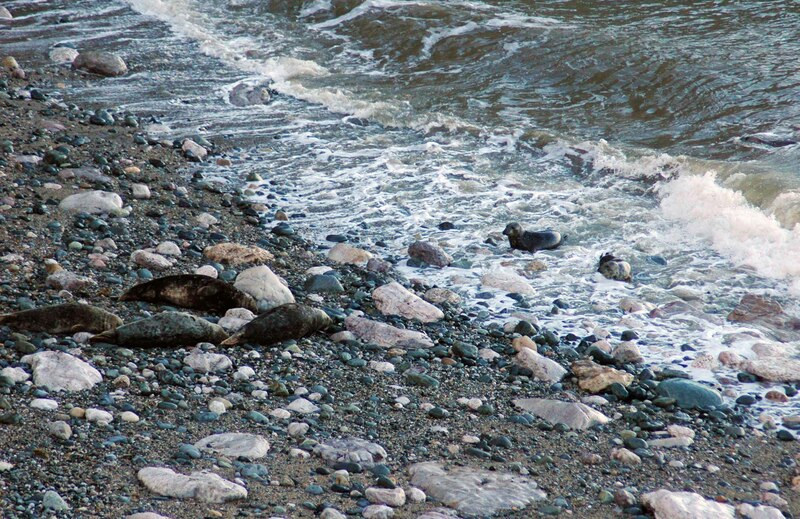 The insistent barking of his dog alerted its owner to the plight of a young Grey Seal trapped beneath the huge boulders of the extra sea defence in front of the promenade wall at Rhos-on-Sea on Thursday morning. 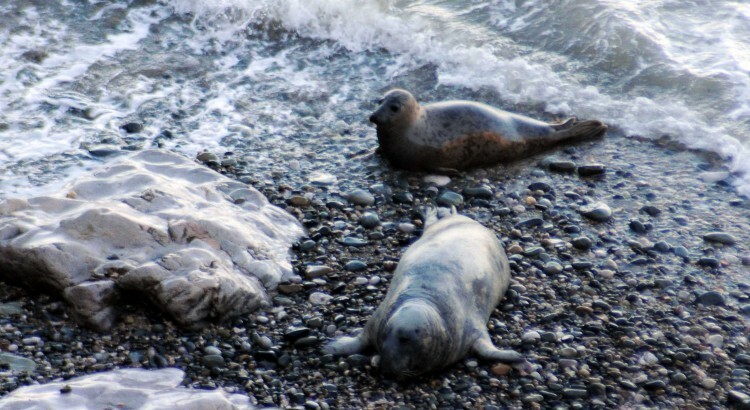 He put in a call that resulted in the arrival of a team from the Welsh Mountain Zoo Seal Rescue Unit to assess the situation; they will only intervene when it is absolutely crucial to the survival or well-being of an animal. 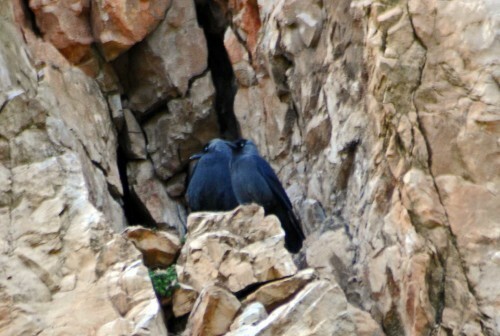 In this instance help was needed as the hapless youngster had worked its way through spaces between the rocks, ultimately becoming trapped. 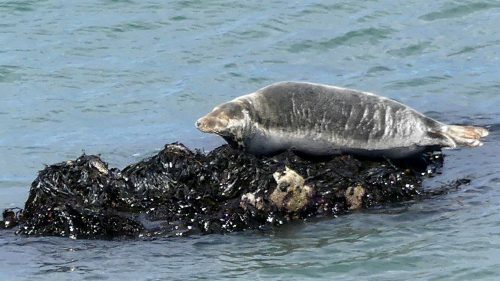 It was clear that the seal was unable to retrace its path back to the shore and was therefore also out of the reach of its mother. 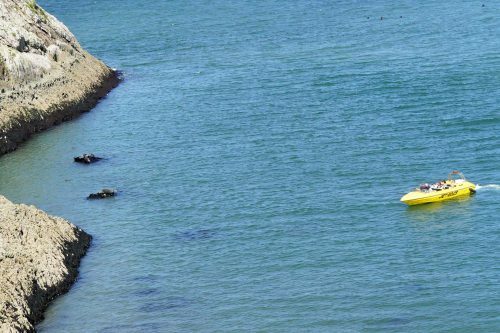 Someone said that the mother, spotted swimming offshore earlier, had been frightened away by a jet-skier, but in any case she would not have approached her baby whilst we were anywhere nearby. 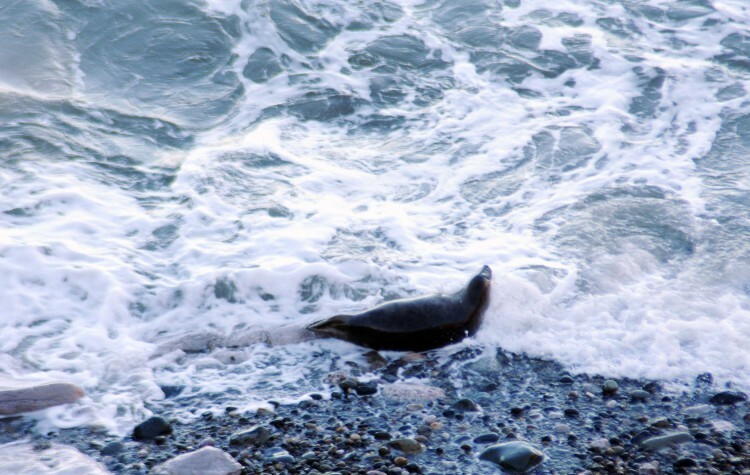 The baby seal was still on shore level, but due to the slope of the boulders, from a rescue perspective he was at the bottom of a deep hole and underneath a rock. 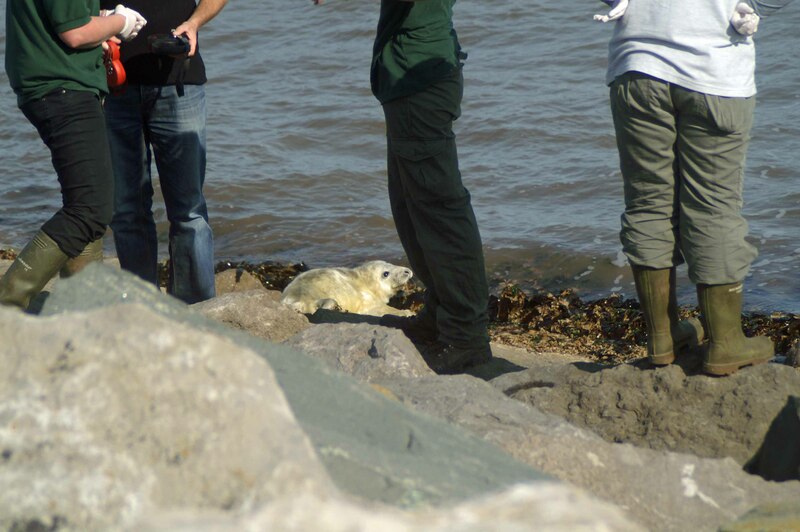 One of the team, Michelle, was small enough to squeeze down to reach the seal, but getting him out was another matter. 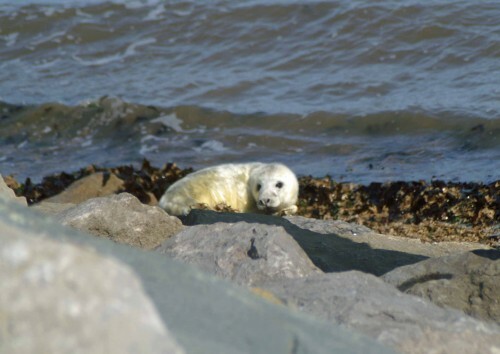 A baby Grey Seal is born weighing in at around 14-15kg (30lbs), so no lightweight and the awkwardness of this one’s position further added to the problem. With no lifting equipment available, some creative thinking was called for and someone had the inspiration to try improvising a hoist from dog leads. There were plenty available amongst the small crowd of concerned onlookers that had stayed to offer moral support throughout the rescue and although not ideal, Michelle managed to loop one around the seal’s well-padded body and pass it up to the girls at the top, who carefully hauled him out. 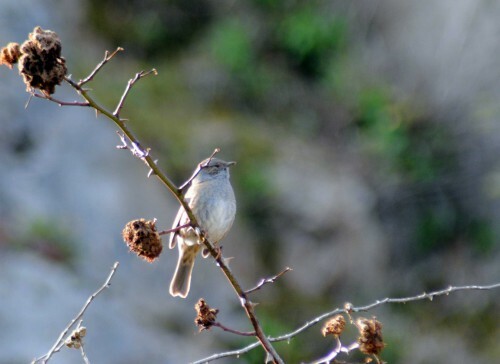 It was unharmed and seemed fit and healthy, but the fresh appearance of his still-attached umbilical cord indicated that it was very young – probably no more than a day or so old. It was hoped that by placing him on the shore close to the rocks that the mother would soon find him. Passing the spot a short time later I heard him calling and spotted him in the water where he appeared to be struggling and was being knocked against the rocks by the waves of the incoming tide. 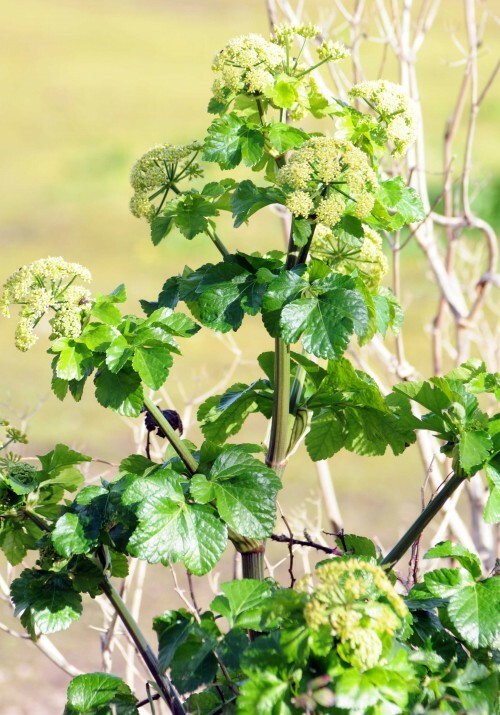 There was still no sign of the mother; although she may have been nearby, any sight she had of people would be perceived as dangerous to her baby or herself and she would not approach, so the area needed to be very quiet. 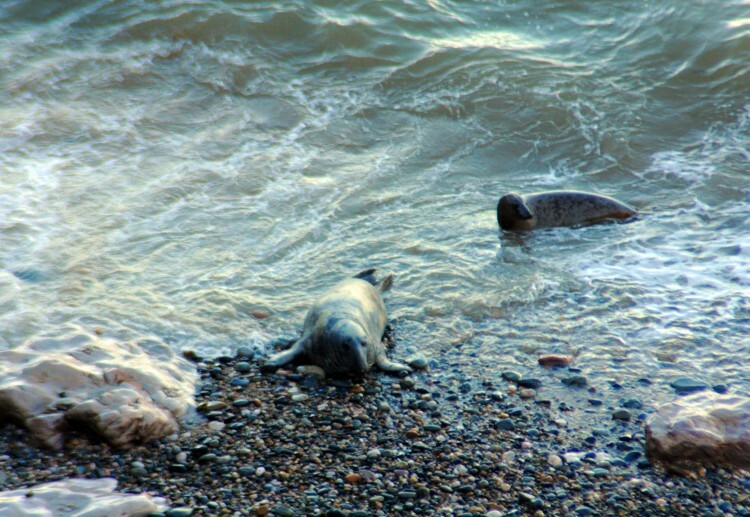 Later again I returned to the promenade and heard the loud and plaintive calls of the baby seal as I crossed the road. 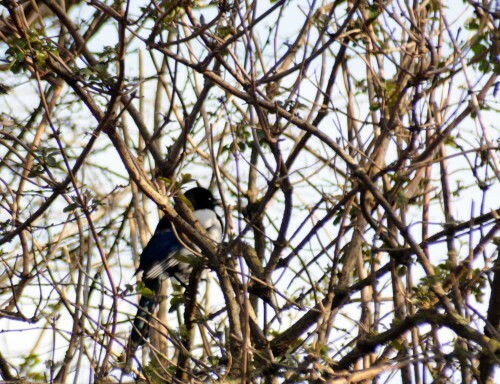 They seemed to be coming from very close to the spot he had originally been rescued from and as I couldn’t see him from above, I walked along the shore edge to try to find where he was exactly. 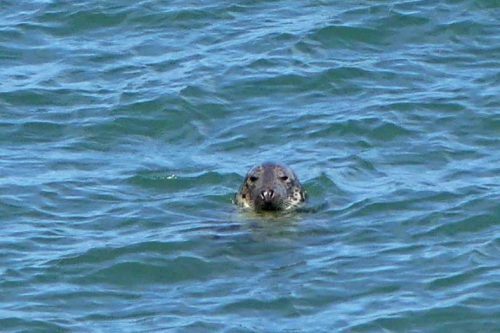 I was pleased to see Michelle who had received another call reporting that the seal was still there and sounding distressed. 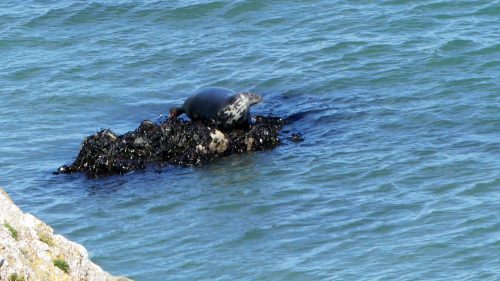 She climbed up onto the rocks and had a look around, but the seal had now stopped calling and could have been anywhere. 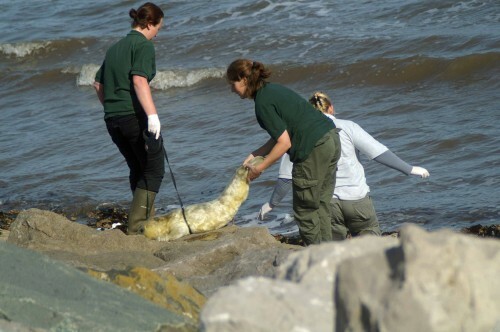 She told me the RSPCA would return on Friday morning and if the seal was still there that they would take it to the Seal Sanctuary to be cared for. ” This rescue was one I’ll never forget. 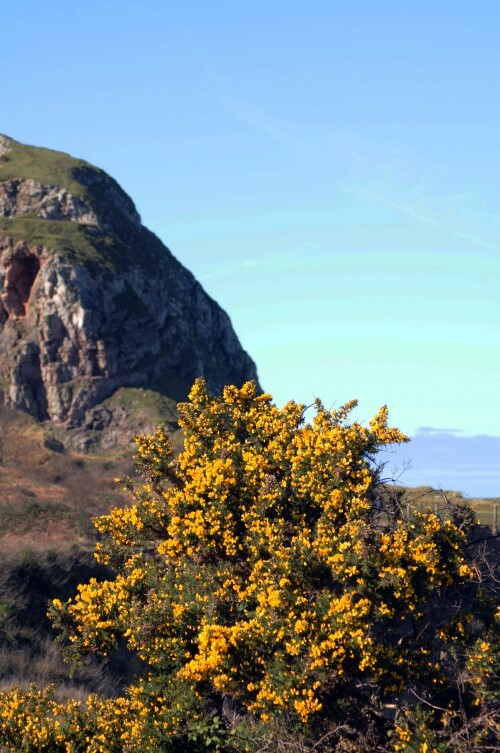 My muscles ache, I have bruises in odd places after climbing down the rocks into a small dark place. But it was worth it! I went down again after work (about 8pm), located it and with help from passers by and this time a catch pole that I brought with me, we got the seal out. It was in the wrong place and weaker than in the morning, so I brought it back to the seal unit where it is now much quieter as it’s not hungry anymore”. Since the zoo opened in 1962 a wide variety of injured and orphaned native species have been brought in for care and rehabilitation. 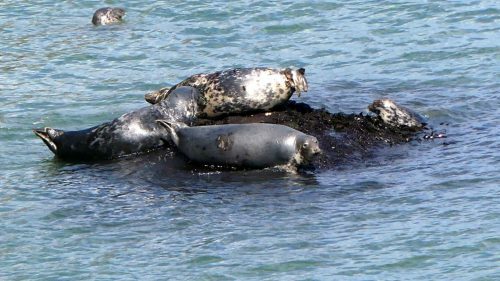 Most of this care, in recent years, has concentrated on young grey and occasionally common seals. 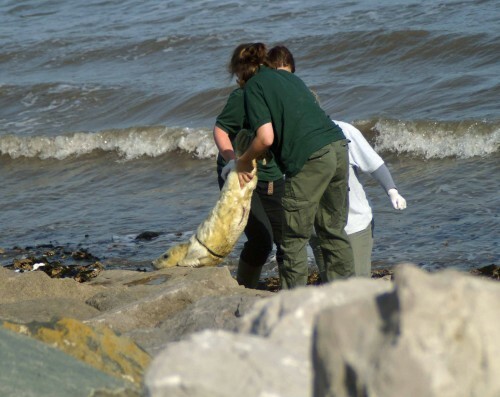 This work is carried out in collaboration with the RSPCA, and in 1997 the North Wales Seal Rescue Centre was opened at the zoo. The centre has two filtered pools and an indoor intensive care unit. This development, funded by zoo friends and supporters, has resulted in an improvement in the care given, and an increase in the number of animals treated, before their release back into the sea.